The BolaWrap 100 discharges an 8-foot Kevlar tether to restrain unruly suspects. Wrap Technologies of Las Vegas, Nevada has introduced the BolaWrap™ 100 less lethal device for law enforcement. The BolaWrap is a hand-held device appearing to be a cross between a large remote control and a flat electric razor, and has earned a nickname of the “Lasso Gun.” Using an easy bush-button trigger, the BolaWrap is designed to propel a Kevlar tether at about 380 feet-per-second (fps) towards the intended target. As the Kevlar tether leaves the BolaWrap cartridge it expands out in a horizontal line. Upon impact with a target the tether wraps around legs, body or arms of the target with enough energy to wrap the target several times, leaving no unused portion of the tether dangling free. Police use of force is one of the hottest debates in America today, so law enforcement leaders and officers must take note and continue to examine, review, and even modify training and procedures. Along with those reviews, keeping abreast of new technology, techniques, and opportunities to de-escalate dangerous confrontations should be paramount. There are plenty of gimmicks on the market to avoid, so wise police administrators should be cautious when evaluating the newest device or technique. However, occasionally the new idea makes a lot of sense. We’ll dive into the benefits and limitations of the BolaWrap and let you decide. The United States 10th Circuit Court of Appeals has recently decided the case of Perea v. Baca and City of Albuquerque. The result will likely have widespread impact on officers across the country. The excessive force lawsuit against Albuquerque, New Mexico police officers was based on the officers use of a TASER™, mostly in “drive-stun” mode, during their attempt to subdue a mentally unstable subject. The U.S. 10th Circuit Court of Appeals ruled against the officers, and their decision paid particular distinction between use of force during a well-being check versus use of force during an arrest. The use of the Taser as an intermediate control weapon has been widely used by law enforcement agencies around the world, not just in the United States. However, the use of the Taser in the U.S. has seen particularly harsh responses by some groups. The death of suspects after a Taser use has been called reckless homicide by some, while vehemently defended by the company as scientifically unproven. In deed, most of the Taser deaths absent some other factor (like falling) involved persons with high mixtures of controlled and other drugs in their systems. The P4 VKS shoulders like an AR-15 for greater aiming than traditional launchers. 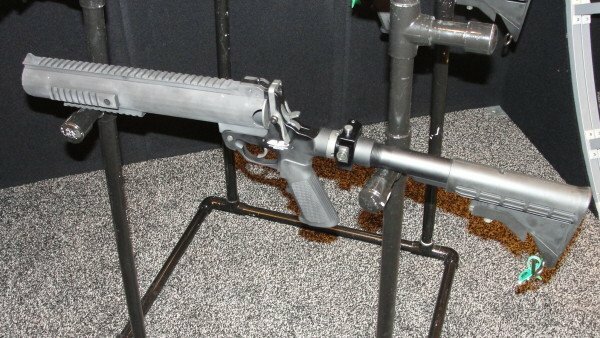 PepperBall announced a brand new launcher at SHOT Show this year. Well, sort of! The new Pepperball P4 VKS launcher is an advanced design of the Security With Advanced Technology (SWAT) MK-IV launcher, the was brought on board when SWAT merged with PepperBall back in 2008. 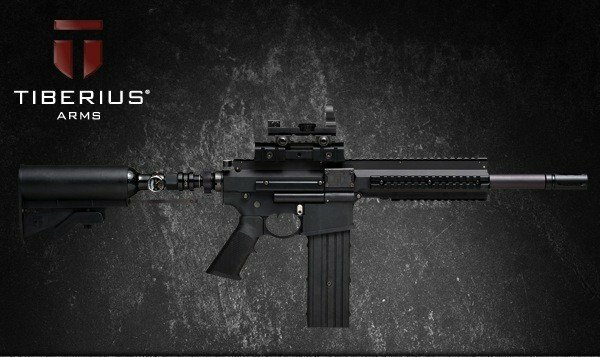 Taking on a very familiar AR-15 style look, the P4 VKS is actually constructed of an upper and a lower receiver. Coming with a rifled barrel, and a capacity ranging from 10-180, the P4 VKS could become one of the most popular chemical munition launchers for American law enforcement. 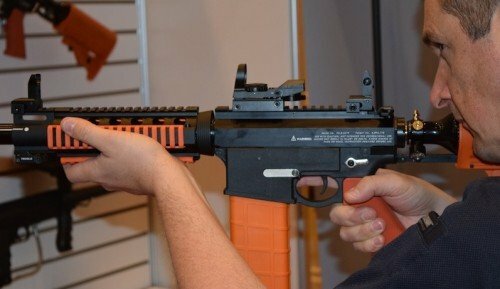 With the recent upsurge in civil protests, and outright riots, I thought it would be interesting to review the new T4.1 series paintball marker rifle offered by Tiberius Arms. The T4.1 paint ball marking rifle is designed on the AR-15 platform, but is a dedicated paint ball marking rifle. The large CO2 charging canister is located inside of the modified stock, yet the stock’s innovative design still allows some adjustments for shooter adaptability. At the AMTEC booth the floor representatives were eager to show off the AMTEC single shot 37/40mm launchers. These launchers feature a breech break open action, ghost ring rear sight, manual safety, and a very smooth double action trigger. They are also available in black, OD green, or tan. The AMTEC single shot 37 or 40mm launcher (made to fit only one available size).